Wild Huckleberry Tea was one of the souvenirs that I bought for myself when I ventured to Yellowstone (I also bought a huge mug!) – it just seemed like an excellent idea to pick up tea for myself! The packaging is actually a thin sheet of wood that is so thin that it is pliable and able to bend around to form a cylinder. The tea bags come in a silver-tone packaging that has no way to reseal, so I put the tea bags into a freezer zip bag. Part of the problem I found with this tea is that it lacks an ingredients list – I can tell by smelling it that there is huckleberry flavouring somewhere, and it’s a black tea. The huckleberry smell is very strong and it smells sweet. 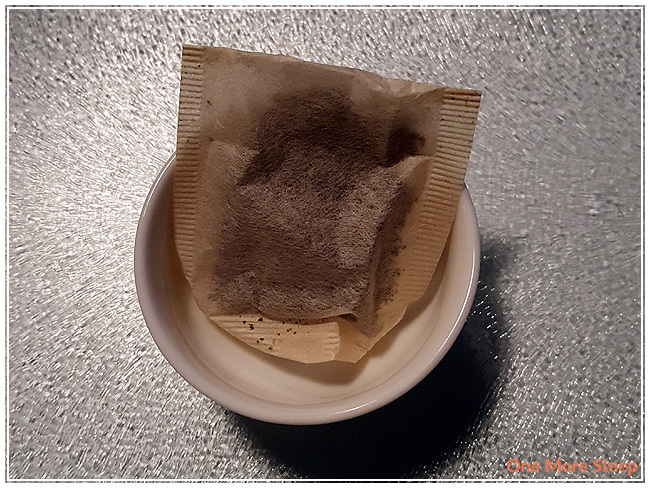 As there were no recommended steeping instructions, I opted to follow the usual black tea steeping times and temperatures that I go with: 212°F (100°C)/boiling water steeped for 3-5 minutes (I went with 4 minutes). Wild Huckleberry steeps to a reddish orange, and smells like berries! I can make out the black tea base in the smell. Tasting the tea for the first time, I find that there is a mild astringency that isn’t off-putting, and that the berries taste is quite mild compared to what was expected based on the stronger huckleberry smell. It is tasty though. 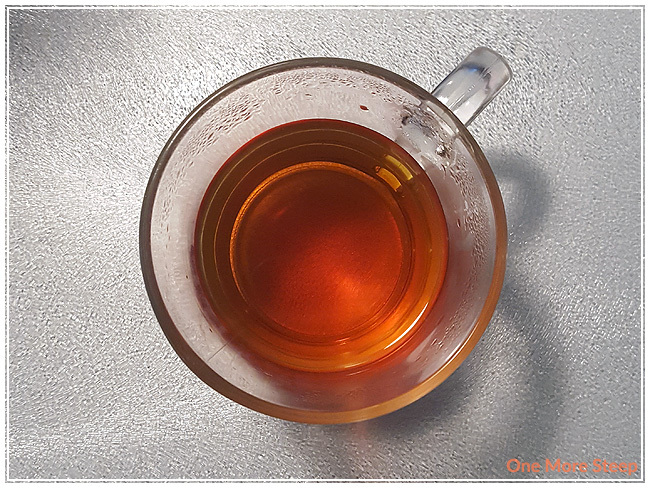 I wound up adding a little bit of honey to the tea while it was still hot, and I found that it brought out the huckleberry taste a bit more in the flavour of the tea. It never quite reached what I was expecting (based on the smell of the steeped tea), but it did get closer. 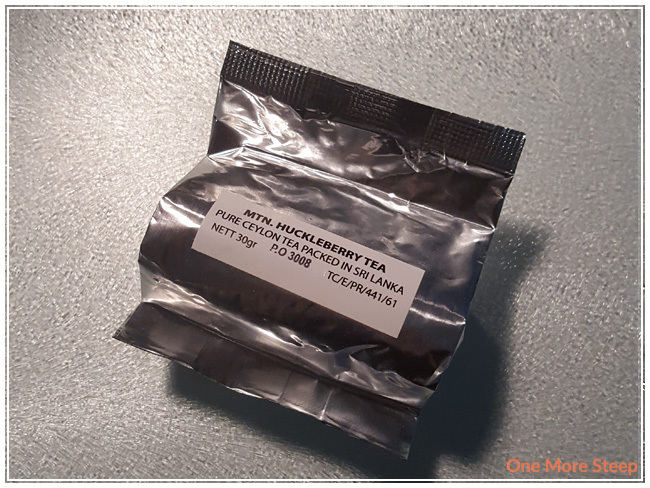 I did attempt to resteep Wild Huckleberry and I found that it did very poorly for a second steep as the huckleberry flavouring was all but gone – it was present in the aroma of the tea, but gone in the taste. 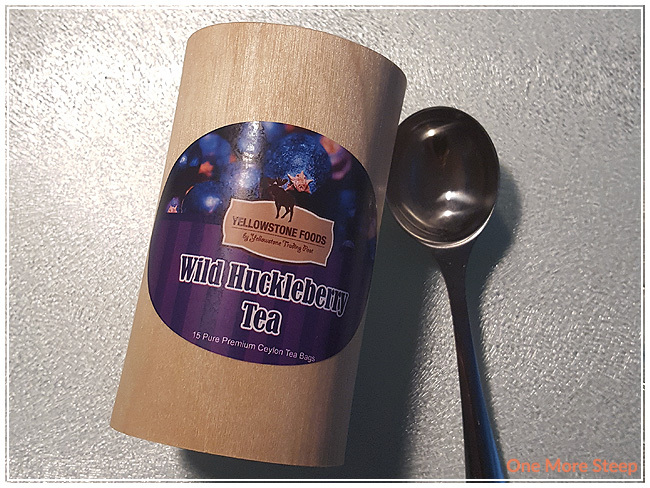 I liked Yellowstone Foods’ Wild Huckleberry Tea. It is a bit pricey for what it is (works out to be $0.53USD/cup!) and I would love to find a less expensive version of it, I find having the huckleberry flavouring in the black tea is a nice change to a plainer bagged black tea. I definitely feel that the tea benefits from having a sweetener, and I think it would make a fantastic tea latte. It’s a yummy tea, but I’ve always been a fan of black teas. Despite the cost, I would still have bought it while on vacation because it doubles as a tasty souvenir.